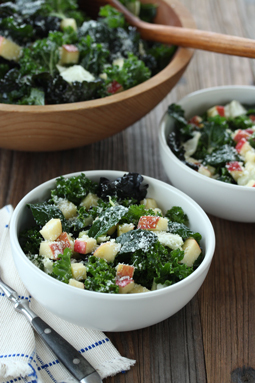 Kale Salad with Garlic-Anchovy Dressing - A recipe from Savor California, the online showcase for extraordinary gourmet foods and beverages from California. Mash the garlic, capers and anchovies together, either in a mortar with a pestle or on a cutting board with a chefs’ knife. Transfer to a bowl if not using a mortar. Add the mustard and lemon juice, stir to mix well. Measure the two oils into a cup measure with a pouring spout. Slowly pour a thin stream of oil into the dressing ingredients as you stir vigorously with the pestle or whisk to create an emulsion. Once emulsified, add a few dashes of fish sauce and whisk until incorporated, taste for seasoning. To assemble the salad, mix the kale, cabbage, and apples. Liberally dress with garlic-anchovy vinaigrette coating all ingredients evenly and sprinkle with pecorino.